Largest and best-conserved ruins of a Jesuit mission in the province of Misiones in the NE Argentina from the 17th and 18th Century. Declared UNESCO World Heritage site in 1984, together with the missions of Santa Ana, Loreto, and Santa María la Mayor. Founded first by Padres José Cataldino and Simón Maceta in the region of Guairá (now Paraná in Brazil), like several other ones up from 1609, but they had to be relocated further South, due to the continuous attacks by Portuguese slave traders. The famous movie "The Mission" by Roland Joffé (1986), with Jeremy Irons and Robert de Niro as protagonists, refer to these historical events. After some time close to the river Yabebirí in Misiones since 1632, San Ignacio Miní was established at its current location in 1696. The constructions are of an impressive Baroque and native Guaraní style. Around 1715 it was home for more than 4000 people. Following the expulsion of the Jesuits from America in 1767, the missions were abandoned to the elements. 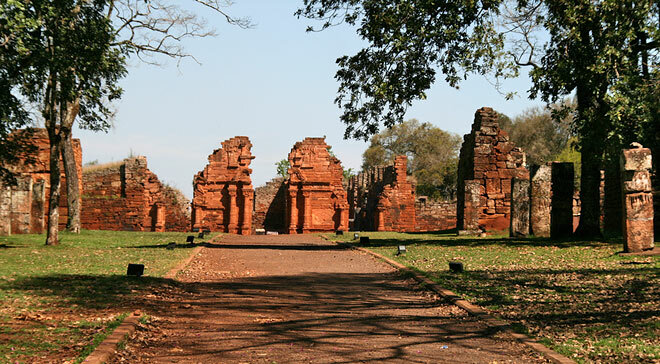 San Ignacio was also destroyed by Paraguayan troops in 1817. The protection and restoration of the ruins of San Ignacio Miní already started in the 1940s.